As teachers know, the new Australian Curriculum includes three cross-curriculum ‘priorities’, one of which is Aboriginal and Torres Strait Islander histories and cultures. One of the science topics includes Year 2 students identifying toys from different cultures that use the forces of push or pull, and this made me wonder about traditional Aboriginal games and whether there was a concept of a ‘toy’ in nomadic lifestyles. I’ve read a few memoirs and a quite a few children’s books by ATSI authors but I don’t recall any of them referring to this topic at all. Keen to include Aboriginal perspectives on this topic if possible, I contacted Dr Anita Heiss who is Adjunct Professor at the Jumbunna Indigenous House of Learning, at the University of Technology, Sydney. Many teachers will also know her as the author of My Australian Story: Who am I? But she also co-edited the Macquarie PEN Anthology of Aboriginal Literature which I recommend as an introduction to the diversity of indigenous writing – see my review at ANZ LitLovers – and she is also the author of these entertaining novels: Manhattan Dreaming, Not Meeting Mr Right, Avoiding Mr Right, and Paris Dreaming. These popular novels are about sharing the highs and lows of being an urban Aboriginal woman but pitched at a mainstream audience. Read more about the rationale for these ‘chick-lit’ novels here. Her most recent book is Am I Black Enough for You? which as the book blurb says is a rejoinder to racist remarks made about ‘being too ‘fair-skinned’ to be an Australian Aboriginal. Such accusations led to Anita’s involvement in one of the most important and sensational Australian legal decisions of the 21st-century when she joined others in charging a newspaper columnist with breaching the Racial Discrimination Act. He was found guilty, and the repercussions continue. This book is on my TBR and I will be reviewing it on the ANZ LitLovers blog when I’ve read it. Yulunga, Traditional Indigenous Games is an ‘activity resource of over 100 traditional Indigenous games created to provide all Australians with an opportunity to learn about, appreciate and experience aspects of Indigenous culture’. It’s available as a CD-ROM. Order it here. The Critical Classroom has all kinds of useful resources including this game: Birrguu Matya: A Wiradjuri board game. Links for where to buy it are here and if you ‘like’ The Critical Classroom at Facebook you can keep in touch with all kinds of stuff. If you know of any additional resources or bloggers who’re working on this too, please share what you know in the comments below. Magabala Books have sent me another lovely little picture book on the theme of conservation and caring for country. Sisters Tracey Holton-Ramirez and Angela Ramirez are descended from the Ngarluma and Yindjibarndi people of the Pilbara region of Western Australia, a place that most Australians associate with massive mining projects. However this little book with its striking full colour illustrations is not about the Pilbara, it’s about a critically endangered frog found only in the snowy alpine regions of the Kosciuszko National Park in NSW. The book is pitched at young children so it has an optimistic message about doing what you can: a boy and his father arrive in a 4WD, and when the boy realises that the frogs need some help he and his father clean up the rubbish and set off home discussing what more they can do. At the back of the book there are some facts about the Corroboree Frog and its habitat, some websites to visit, and a page about the authors. The Little Corroboree Frog is their first collaboration and I hope we will see more of their stunning artwork in future books. We’ll use it at my school in the Year 1 & 2 unit about Australian Animals. The Little Corroboree Frog is due for release in March, and you can pre-order it from the links below. When At the Very Heart: 100 Years in Remote Australia first arrived chez moi from publishers Wakefield Press, I thought it was a coffee table book. It’s actually much more than that, and this copy is destined to be catalogued at my school library because its content is a valuable contribution to Australian history. Clifford Peel died in action on the Western Front just before the war ended and you can see his name on the Roll of Honour at the Australian War Memorial. It took the indefatigable Flynn ten long years to create the RFDS, gathering support from far-sighted entrepreneurs such as Hudson Fysh who founded QANTAS and H V McKay of Sunshine Harvester fame. The book also traces the history of the Australian Inland Mission (AIM) and its successor Frontier Services. Flynn was no city missionary, and neither are his successors. Remote Australia isn’t a place for churches and proselytising, it’s a place for adventurous people who are willing to fit into the idiosyncratic lifestyle of people who live in remote isolation, and who are willing to listen rather than talk. City kids like the ones I teach will get a some idea of the vastness of the inland and hardships faced by pioneers from the graphics in this book. There is one of Flynn’s amazing 1924 map which shows how the train lines peter out, leaving a vast emptiness at the heart of our continent. Photos show just how hard it was to get around in the early days: there are vehicles of all descriptions getting bogged in the sand. (Storry makes the point that people tend to photograph the same things. After all, there’s not a lot else to take photos of between homesteads, eh?) The section about the mail service in its early days is illustrated with photos of posties on camels and horses and there is a poignant reproduction of a notice trying to locate a Victor Larsen so that his letter can be delivered. There is also an enchanting picture of a new schoolhouse in Gippsland, which may well have been the ‘pride of the community’ but would have tested the mettle of both teachers and students. Made of rough timber and corrugated iron, it would indeed have been ‘severely cold in winter and hot in summer’ but it boasts a garden, a newly planted tree and a rose-bush, with netting to deter rabbits which were already making their presence felt in rural Australia. the Frontier Services Midlands Patrol based in Oatlands Tasmania in the high mountains wilderness. However, while At the Very Heart isn’t a hagiography, I would have liked to have seen more about services for indigenous communities, which might have had to address some failings. There is heaps more to discover in this brilliant book but I think you should get your own copy and/or give one to someone you love and /or to an impecunious school library near you! The book has a timeline, references, a bibliography and an index. I have just used this book this week as part of my lessons using It’s a Miroocool by Christine Harris, (which is shortlisted for the CBCA Book of the Year Award). My city kids know very little about life in the Outback and I was able to use At the Very Heart to show them pictures of the School of the Air, and outback roads, housing and landscapes. I used the aerial shots of an outback town to talk about how the town would have a supermarket and a petrol station; a primary school but perhaps not a secondary school; sportsgrounds but perhaps not a library; a doctor but perhaps not a hospital – which gave me the opportunity to explain about the Royal Flying Doctor Service. The book certainly gave the children a vivid picture of outback life and I recommend it to anyone looking for a resource for this purpose. Source: review copy courtesy of Wakefield Press. Cross posted at ANZ LitLovers. This is another book review that I had neglected to cross-post here. I found it in my annual housekeeping spree at my ANZ LitLovers blog and am belatedly cross-posting now. Tommy Farrell’s parents run the pub, but he’s been left to run it single-handed because everyone else has gone to Mass to celebrate the ‘Liberator’s’ birthday. The Liberator was Daniel O’Connell, who campaigned for the right of Irishmen to take their place in the British parliament, and he’s still a hero in Ireland. 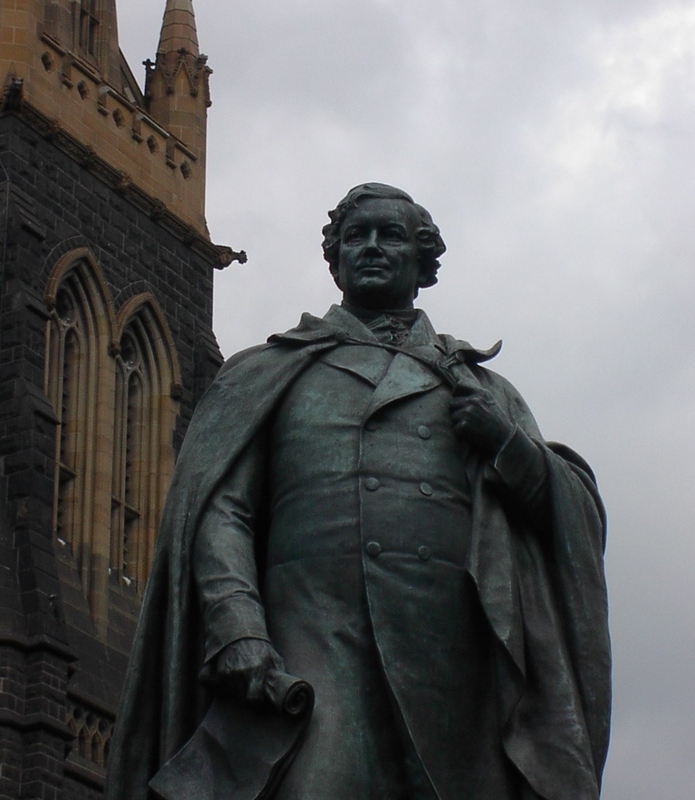 We’ve got an imposing statue of him too, here in Melbourne outside St Patrick’s Cathedral , and that’s because the Irish were a significant presence here in Australia, right from the start. Jill Blee has specialised in the history of the Irish in Australia, but the story wears her scholarship lightly. Perhaps in homage to James Joyce, the tale is structured like Bloomsday, covering the events of the day from first thing in the morning until late at night. Tommy gets the pub to rights, the early drinkers come in, and the blarney starts. Amongst themselves, this Catholic contingent manage to argue about all manner of things without too much angst, but when the Protestants arrive things become more heated and there is a punch up between the Orange and the Green, just like those saloon fights you’ve seen in American westerns, with heads getting knocked together and glassware flying everywhere.There are many threads to the tale. There’s an appalling priest whose curses have dreadful effects on the surviving family; and his superstitious flock fear his ire as much as they fear the flames of hell from the catechism. Unemployment has led to discrimination that wasn’t there before when jobs were plentiful, and there are terrible mining accidents now that the easy pickings have run out. There’s an over-ambitious social-climbing mother, whose son Gerald is spoiled rotten because he’s destined for the priesthood, and Tommy’s in love with a girl thought not to be good enough for him. While the story is reasonably engaging, (once you get used to the thick Irish accent of the narrator) it was the little details that I especially enjoyed. It was fascinating, for example, to hear poor Tommy trying to work out the best way to travel to Bendigo on foot (it’s about 95k) in the days when the route was dirt tracks and virgin bush and Daylesford the tourist mecca was just a hamlet. 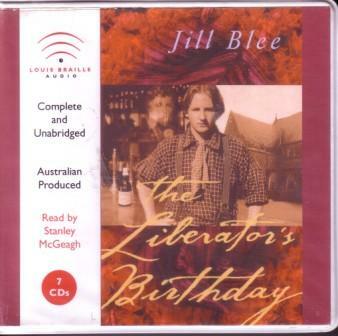 I hope teachers of Australian history know about this audio book, because playing a few extracts would be a valuable teaching tool. Most enjoyable. I have bought Blee’s other books, The Pines Hold their Secrets (about Norfolk Island) and Brigid (about the Irish potato famine) to read at a later date. 7 CDs , 8 hours approx running time. I’ve been doing some house-keeping on the ANZ LitLovers blog, and have discovered a review of a book for children that I’ve neglected to cross-post here. So here, belatedly, is my review of The Railway Children by Edith Nesbit. It was written primarily in the context of reading A.S. Byatt’s The Children’s Book, (which is not a children’s book) but you can skip those parts. I thought it best not to delete them because the last couple of paragraphs about The Railway Children don’t make sense without them. The reason I read it is because there is apparently some connection to A.S. Byatt’s The Children’s Book which was shortlisted for the Booker and was on the ANZ LitLovers schedule for May 2010. The Children’s Book ‘is about a famous writer who is writing a private book for each of her children. It deals with childhood and family secrets, against the backdrop of the Edwardian world with the First World War looming on the horizon’. (ABC Radio National Book Show) As I have yet to read The Children’s Book I offer this analysis of The Railway Children for those who have, and will refer to it later on myself. Consistent with the didactic children’s literature of this period, the children are impossibly ‘good’. They get into a few scrapes, it is true, but they are kind and generous to the lower orders (except for poor Mrs Viney who is given short thrift when The Old Gentleman sends along two much superior domestics who dismiss her as an ‘old muddler’ (p182) and have her days unceremoniously cut back to two). The children save a train from a derailment; they rescue The Old Gentleman’s grandson Jim when he breaks his leg in the tunnel; they organise a birthday celebration for the gruff and somewhat ungrateful ‘Perks’; they rescue a baby from a burning canal barge; and – with schooldays knowledge of French superior to that of any of the workers at the railway station – they intervene to succour a Russian emigree. They also avert a disaster by waking up a sleeping signalman but they do not sneak on him, reacting with over-the-top indignation when he offers them all he has to keep quiet about it. (p165) They put in this splendid effort, soldiering on as inspirational role models for the children of the British Empire, while Mother does her bit as a saintly stalwart who never gets peevish or angry and weeps only in private. There is a triumphant reunion at the end when The Old Gentleman helps Father to clear his name and presumably they all live happily ever after. Enid Blyton, writing later on in the 20th century, made a point of asserting the moral superiority of the Famous Five over the lower classes. Her villains were always gypsies, foreigners, and scholarship students and the police (with their clumsy boots) were always stupid. Nesbit is just the same. Even when Peter steals coal from the railway’s supplies, he gets off Scot-free because he had a noble cause – but we know from Perks’ remarks that the poor of the village obviously also nick the coal because they’re cold too – but they don’t get away with it. We also know though it’s not made explicit that Father has been unjustly imprisoned because of the stupidity of the police, and it takes the intervention of people with connections (i.e. The Old Gentleman) for justice to be restored. The Children’s Book is the absorbing story of the close of what has been called the Edwardian summer: the deceptively languid, blissful period that ended with the cataclysmic destruction of World War I. In this compelling novel, A.S. Byatt summons up a whole era, revealing that beneath its golden surface lay tensions that would explode into war, revolution and unbelievable change — for the generation that came of age before 1914 and, most of all, for their children. Olive’s daughter Dorothy wishes to become a doctor, while her other daughter, Hedda, wants to fight for votes for women. Her son Tom, sent to an upper-class school, wants nothing more than to spend time in the woods, tracking birds and foxes. Her nephew Charles becomes embroiled with German-influenced revolutionaries. Their portraits connect the political issues at the heart of nascent feminism and socialismwith grave personal dilemmas, interlacing until The Children’s Book becomes a perfect depiction of an entire world. The structure of The Railway Children seems quite straightforward: a sequential narrative of 14 chapters with an orientation, complication, climax and resolution. The narrator is omniscient, with occasional patronising intrusions. Flicking though The Children’s Book I see that it seems quite different, because it’s in four parts: The Beginning, The Golden Age; The Age of Silver and The Age of Lead – which doesn’t imply a happy ending although there are fairy tales interspersed among the chapters. There are some references to contemporary events in The Railway Children that might be relevant. Father is in gaol because he has been convicted of ‘selling State secrets to the Russians’ (p142) though of course he didn’t do it because ‘he is an Englishman and uncapable to do such things’ (p143). Peter is ticked off for playing at having a broken leg but is excused because he wanted his sisters to train for Red Cross nurses’ (p171). Uncle Reggie is away serving the Empire in Ceylon (p130) and Szcepansky, (the Russian emigree) had been sent to Siberia for writing a ‘noble’ book, translated into every European language’ (p95) that criticised the treatment of the poor under the Imperial regime. He had deserted when released to fight in the war (which one??) which is ok when you don’t owe your country anything because they have denied you Free Speech (p72). 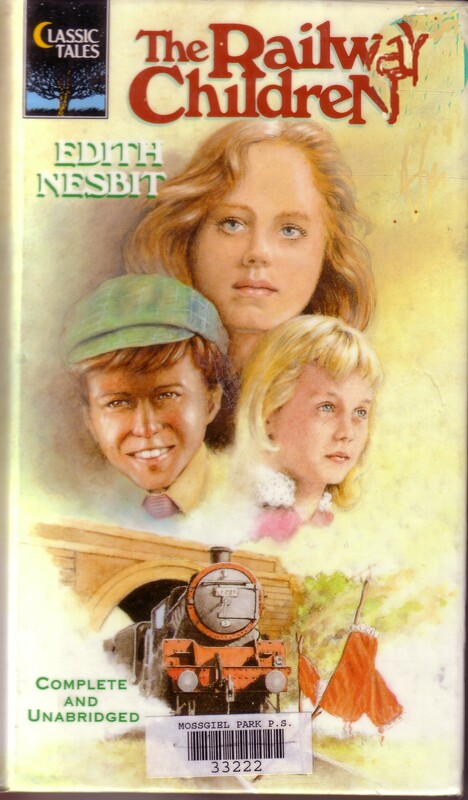 (According to Library Thing’s Author Profile, Nesbit and her husband were ‘founding members of the Fabian Society and their home was a centre for literary and socialist activities‘ but still, I bet some of her contemporary readers found this a shocking idea for children to be reading about). There was a spirited defence of this book in comments on the original blog post, so in the spirit of fair play, I suggest you also click the link below and read them too.